If you suffer from acne this might sound like a familiar story. And if you’re an acne sufferer you have probably been told that the next treatment is going to be the one that “really works.” So, I understand if you are skeptical when I tell you Isolaz really works! I am going to explain what causes acne, and how the Isolaz works to control breakouts once and for all. But first a little background. Did you know the number one reason people visit the dermatologist is for acne concerns? More than 60 million Americans suffer from acne. Most of them are teenagers (80% of teenagers suffer from acne) and adult women (acne in adult women has increased in recent years). Acne is the result of clogged pores in the skin. Our skin is populated with pores, and in those pores are glands (sebaceous glands) that produce oil (sebum). This oil is critical for the overall health of our skin. Oil creates a protective barrier between our skin and the elements. Oil also keeps our skin hydrated and is a vehicle for nutrients that keep our skin healthy and youthful looking. But some of us produce too much oil, and when oil glands overproduce, the excess oil sticks to shedding skin cells and accumulates, creating a clogged pore. This is a perfect place for bacteria to grow. When it does, the pore becomes inflamed and a pimple forms. Hormonal imbalance is the leading cause of breakouts. That’s why teenagers and female adults tend to be the most susceptible to acne breakouts. Abnormal hormonal activity increases the body’s production of sebum, creating the perfect conditions for breakouts. What are the best treatments to end breakouts? If we understand what causes breakouts, what makes them so difficult to treat? Not all acne breakouts are equal, and neither are all treatments. Some cases of acne are more severe than others, and the treatment prescribed generally varies from person to person. Dermatologists typically start treatment with a combination of oral antibiotics to kill acne-causing bacteria and a topical product to unclog pores that contain retinoids. There’s a lot of debate about using oral antibiotics because of resistance, and retinoids make the skin sensitive and dry. In some cases of female hormonal acne, oral contraceptives (the Pill) are very effective at controlling breakouts because they stabilize the body’s hormonal activity. Women and teenagers who experience increased acne breakouts during menstrual cycle are likely to benefit the most from taking the Pill. But, oral contraceptives take time to work. Studies have shown that it can take up three months to see an improvement. Oral contraception has other side effects that should be carefully considered before committing to this option. When the combination punch of antibiotics and retinoids haven’t worked, doctors typically turn to the last option: Isotretinoin. Most of us know it as Accutane. While this therapy can be very effective for severe acne and for those who have failed with other treatments, the risk profile is very high. One of the biggest drawbacks is that Accutane impairs wound healing, so if a client with severe inflammation starts using Accutane they are almost guaranteed to heal with scars. That is why doctors only use Accutane as a last resort. Side effects can include liver damage, depression and serious stomach problems. Pregnant women and women trying to get pregnant should not use Accutane, as it can cause birth defects. Until recently, Accutane was the option for people with serious acne. For those clients, they had to decide between living with acne or living with the possibility of all those side effects wreaking havoc on their bodies. Today we have laser light therapy. More specifically, we have Isolaz. All acne treatments work by reducing and controlling the production of oil. This is what makes laser therapy so revolutionary. Isolaz treats breakouts right at the source with a combination of vacuum to unclog pores and remove excess oil. Broadband light kills bacteria and reduces the activity of the oil gland. Isolaz is painless and has very few side effects. These side effects include mild redness immediately after the treatment in some cases. Redness resolves within an hour or two. Thanks to the fact that Isolaz is a light-based treatment, it doesn’t dry the skin like oral and topical medications. 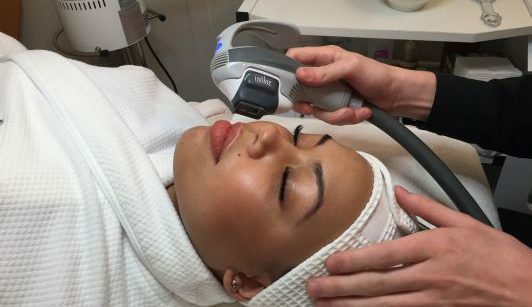 Our clients have seen amazing results with our acne memberships which include Isolaz and a boatload of other facials, peels and light therapy options. Many doctors’ offices in New York City offer Isolaz, but at Skin Bar NYC our service is much more inclusive. A typical Isolaz treatment takes about thirty minutes. The steps include: cleansing the face, then performing two passes of laser treatment and finishing with a moisturizer. At Skin Bar, our Isolaz treatment takes one hour. The steps include: cleansing the face followed with steam and extractions. Then we perform two passes of laser treatment and apply a bacteria-killing masque. We finish with a light moisturizer and SPF. Results can be seen within 24 to 48 hours after the first treatment. Treatments should be done every two weeks for the first three months, then at least once a month to maintain results. Teenage acne usually persists for three or four years, and maintenance should be continued as long as breakouts still occur. Adult acne usually persists for many years and may require a lifetime of maintenance to keep acne under control. Many times clients make the mistake of treating acne and, when it is under control, stopping maintenance only to begin breaking out after a couple of months. So, if you find a therapy that works for you, stick to it. It will be worth the investment in the long run. If you want great skin, but you’re not sure where to start, let Skin Bar NYC help you. Our skin care specialists can customize an at-home routine that will help you achieve your beauty goals. At Skin Bar NYC, we offer the ultimate skin care program in the form of memberships. Pay a monthly membership fee and choose from any of our services, based on your skin care needs. Our program is designed to ensure that you maintain a consistent skin care program. It’s like having a trainer for your skin. And it’s affordable: memberships start at $99. Call us today to find out more.